If you suffer from an allergy, you are definitely not alone. In fact, the number of people suffering from allergies such as hayfever, asthma, eczema and food allergies is increasing. Your immune system protects you against infections by producing antibodies to kill harmful organisms. When you have an allergy, your immune system overreacts to substances that are not harmful to other people. True allergies are reactions to substances called allergens. Common allergens are pollen, mould, house dust mites, animal hairs, feathers, nickel, rubber and certain foods. Reducing your exposure to allergens can be an effective way of preventing an allergic reaction; however, this is not always possible. There are many treatments available to help reduce the symptoms of allergies, although at the moment there are no cures. The house dust mite, which feeds on flakes of human skin, is one of the most common allergens, and causes symptoms all year round. Every household has house dust mites, no matter how clean and hygienic it is, but house dust mites are only a problem if you are allergic to them. 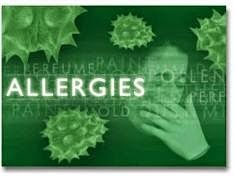 Pollen, mould and animal hairs are other common allergens. You can even become allergic to a substance you have used or eaten for years. All of these allergens are mostly breathed in. They cause sneezing, running or blocked noses, watery eyes and wheezing in up to 40 per cent of the population. Food allergies are most commonly caused by eggs, cow's milk, nuts, fish and shellfish (such as prawns). Food allergies may cause eczema to develop in babies, but older children and young adults often develop a rash (hives). Hives affect one in five people during their lifetime. There have been a number of possible reasons put forward for the rise in allergies. It could be due to an increase in house dust mites because of the way we build and furnish homes. Most homes now have wall-to-wall carpets, and ventilation is reduced to keep warmth in winter and coolness in summer. This results in an even temperature and high humidity - ideal conditions for house dust mites. Air pollution may be playing a role in increasing asthma, and processed foods containing artificial colour and preservatives could be responsible for an increase in food allergies. Changes in children's diets mean they are being exposed to a much wider variety of foods earlier on in life than in the past, possibly stimulating their immune system. How Do You Find Out What Causes Your Allergies? • Do you sneeze or wheeze when you clean the house or empty the vacuum cleaner bag? • Do your symptoms occur when you are in a room with a cat (even if you don't handle the cat)? • Do your symptoms occur throughout the year, or only in certain seasons, such as spring and early summer? • Do your symptoms occur at particular times in the day, for example in the morning and evening? Noticing your own pattern of symptoms is the most useful way of identifying the cause of your allergies. Allergy testing is not routinely done as the results can be confusing, but in certain cases blood tests and skin pricks can be helpful. 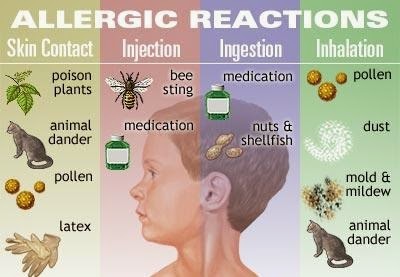 A positive reaction identifies an allergen but does not necessarily mean that it is responsible for your symptoms at that time. Using blood test and skin pricks to test for food allergies is difficult and cutting certain foods from your diet and then reintroducing them is the best way to identify the allergen causing the problem. This needs to be done carefully and under the supervision of a dietitian, particularly for children, who may otherwise lose out on essential nutrients. • Don't allow people to smoke cigarettes in the house. • Breastfeeding your baby for as long as possible (preferably 4 to 6 months) can help your child build up an immunity to allergens. Try to avoid exposing your baby to pets and dust during this time. • Avoid sheepskin underlays as they encourage house dust mites. It is also important to improve your general health. These measures include having a good diet, getting plenty of exercise, getting enough sleep and not smoking. If you have an allergy, you may need to take antihistamines. Rashes are also often well controlled by the newer non-drowsy antihistamines. Antihistamines prevent symptoms (like itching, sneezing, watery eyes, runny noses and rashes) that are caused by the body releasing a substance called histamine during an allergic reaction. The newer antihistamines have very few side-effects. Your doctor will help you find one that does not make you drowsy. If your symptoms cannot be controlled by avoiding allergens or taking antihistamines, your GP may prescribe a steroid nasal spray. These sprays are anti-inflammatory drugs that will help the symptoms of allergies. Because they are applied to the lining of the nose and lungs, the newer steroid drug is hardly absorbed into the blood stream, so the risk of side-effects is reduced. Many different home remedies have been used for treating allergies, but there is no evidence that they are effective. Anaphylaxis or anaphylactic shock is a sudden, severe reaction to a substance, but it is very rare. The reaction rarely occurs in response to allergens in the air (like pollen) but may be in response to a food, bee sting or a drug. The severe reaction causes swelling of the face and throat, difficulty in breathing and a drop in blood pressure. You should call for an ambulance unless your GP's surgery or casualty department is very close. After your first attack you will probably be given an adrenaline injection to carry with you in case it occurs again. Edited by Dr Carol Blow, MB BS, MRCP, MRCGP, DRCOG. Free medical advice online published by Vivienne Balonwu.